I’ve always used a D-handle or “top-handle” style jigsaw. If you asked me why, it’s because, that’s the saw I learned on 25 years ago. 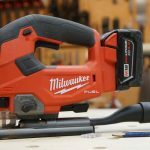 Recently, we’ve been using the Milwaukee M18 FUEL Barrel Grip Jig Saw and are here to tell you our thoughts. 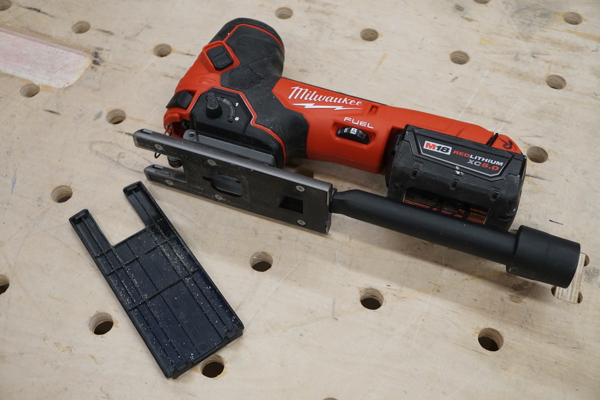 The Milwaukee M18 FUEL Barrel Grip Jig Saw is equipped with a brushless motor, and operates at a higher blade speed than corded jig saws. 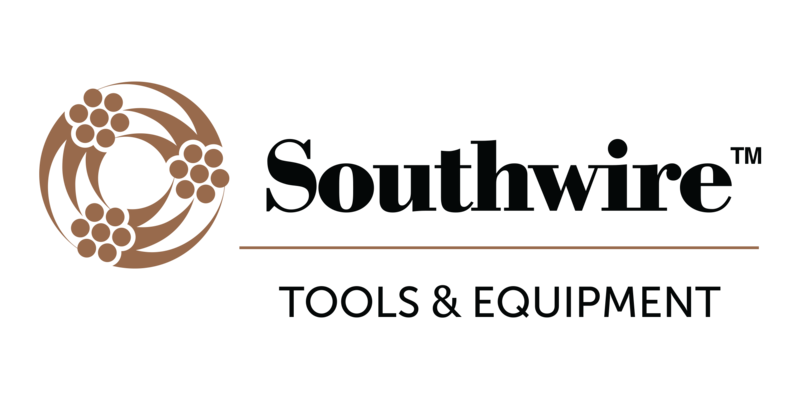 At 3500 strokes per minute [SPM] this saw is capable of cutting up to 105 linear feet of ¾” laminated particle board, that’s the equivalent to about 18 sink cut outs. 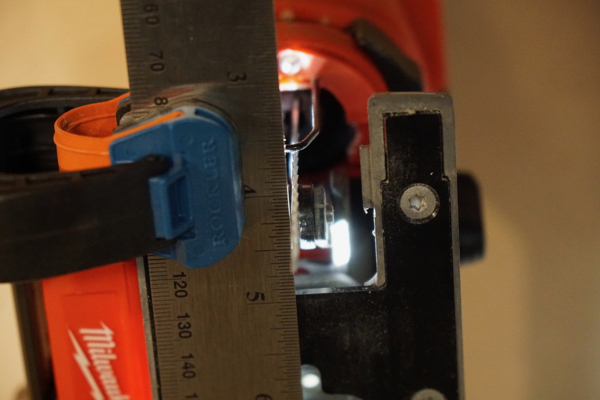 We tested this saws noise level, and measured 99 Decibels. 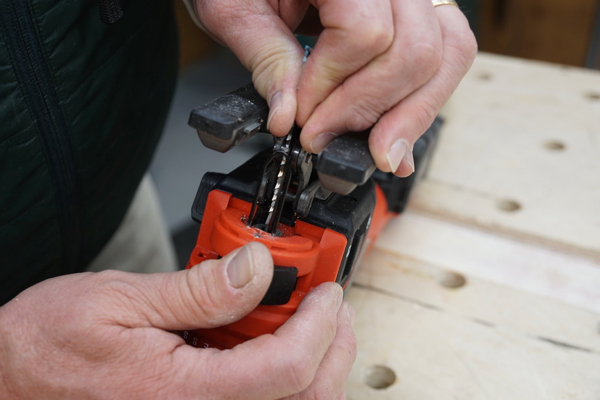 Having a variable speed lets you “set and forget,” the speed so you can turn on the tool, and focus on making that precise cut. 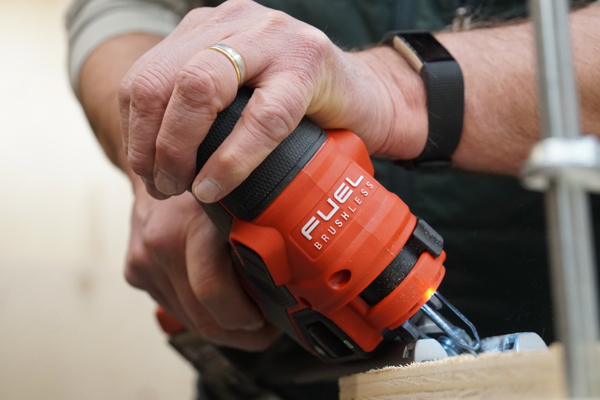 The barrel grip jigsaw has a 6-speed dial, ranging from 0-3500 strokes per minute. There is an “A” on the dial which is an “Auto-Controlled Start” feature. No load SPM drops to help reduce vibration and line up your cut. When the saw is pushed into the material, the saw automatically senses it and turns the SPM up to full throttle. This setting allows the saw to start slowly at 1500 SPM and ramps up to 3500 SPM once the blade is in the material. 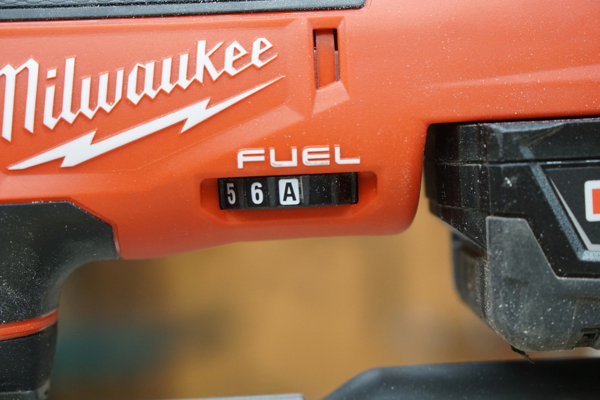 The Milwaukee M18 FUEL Barrel Grip Jig Saw has ambidextrous power switches, on the left and right side of the saw. 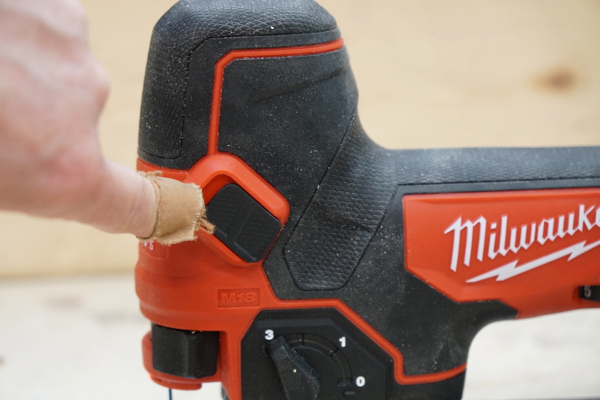 The switch is easily accessed from multiple hand positions, and something that left-handed carpenter appreciate. A quick flick on the power switch activates the LED light, a nice feature. 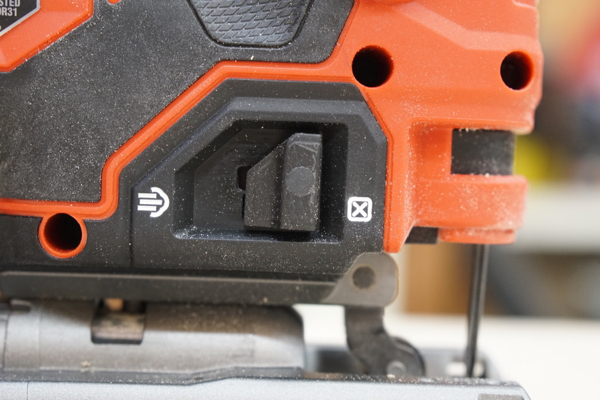 The switch has to be held in the on-position for a second or two to turn on the tool, this helps prevent accidental power ups if the trigger is bumped. When the switch is turned off, the switch activates immediately, and the blade brake stops the blade instantly. I often find that a jigsaw’s quality can be summed up pretty fast if you try to cut a 45-degree bevel on a piece of 3/4″ plywood. If you can cut that bevel in a nice straight line without fighting the jigsaw than you’ve got a winning combination. This jigsaw had no problem cutting nice straight 45-degree bevel cuts over long lengths. When cutting at 90-degrees this saw is near perfect. The cut quality when cutting upside down is excellent and the saw plunge cuts like a champ. 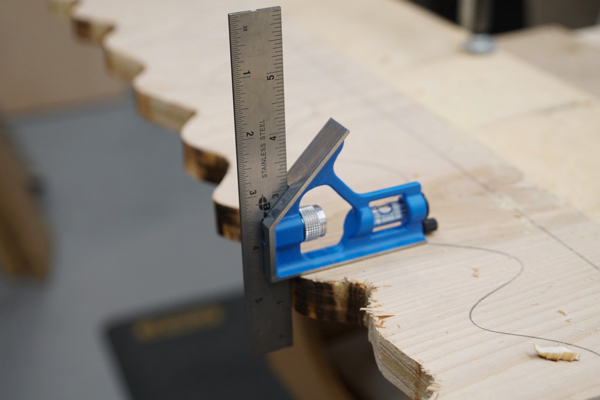 We tested the jigsaw in Oak, Pine, framing lumber and plywood. The saw cuts well in all of those materials, and tracks well. We made straight, 45 degree and scroll cuts and checked for square and parallels. We also did some moderate, and aggressive scroll cutting in plywood and on this test we did see some moderate deflection on the aggressive scrolls, but very little. All jigsaws employ some sort of counterbalance system to reduce the up-and-down shaking created by the reciprocating plunger and blade. We did not feel any excessive vibration that concerned us. 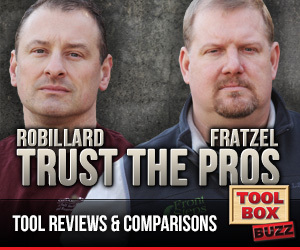 The front of this tool has a plastic, key-less, slide actuated, blade change that ejects the blade. This jigsaw uses all standard T-shank blades. 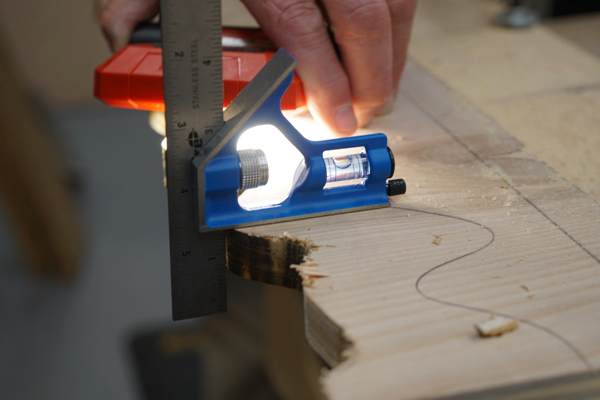 The saw features a 1-inch stroke length, 4-position [0-3] orbital action switch to allow the jigsaw versatility when cutting different materials. The blade inserts fairly easy and ejects when released. We noticed some alignment issues on a few blade insertions, requiring some futzing to get the blade indexed at 90-degrees. This did not happen every time. The keyless shoe bevel has positive detents at 0°, 15°, 30° and 45° but will also hold its position in between those settings well. To adjust the bevel, you need to use a 4 mm Hex wrench stored in the rear of the base plate. 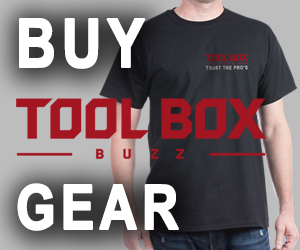 The wrench storage is tight and secure – no worry of it falling out. Note – Battery packs larger than a 5.0 Ah will strike the work-piece on a 45° bevel. 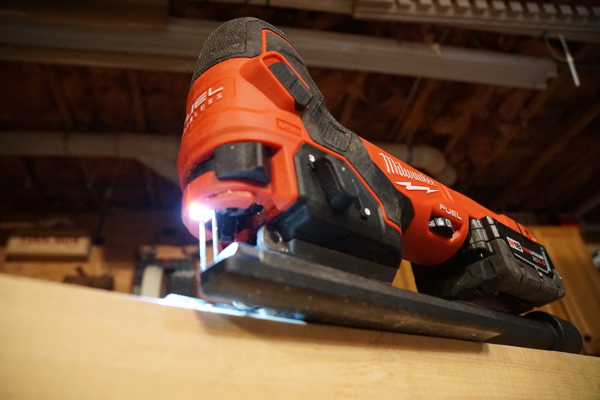 The Milwaukee M18 FUEL Jig Saw has one integrated LED that illuminates the work area well, and stays on for 11 seconds after the trigger is released. 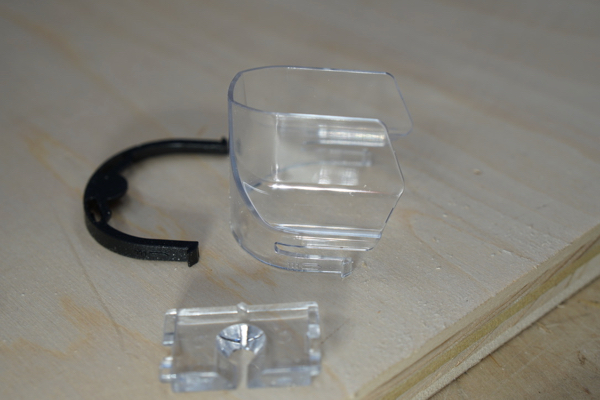 There is a small black, plastic clip that covers the LED for upside-down cutting. While a great idea, We’re betting that this clip will be the first item to get lost. An LED switch, or internal, sliding shade would a more realistic fix to this application. An On/Off cut line blower keeps the cut line clear of debris, and allows user to turn off blower when using dust extraction. We tested the blower and it’s powerful. It completely cleared the sawdust 4” in front of, and away from the tool. 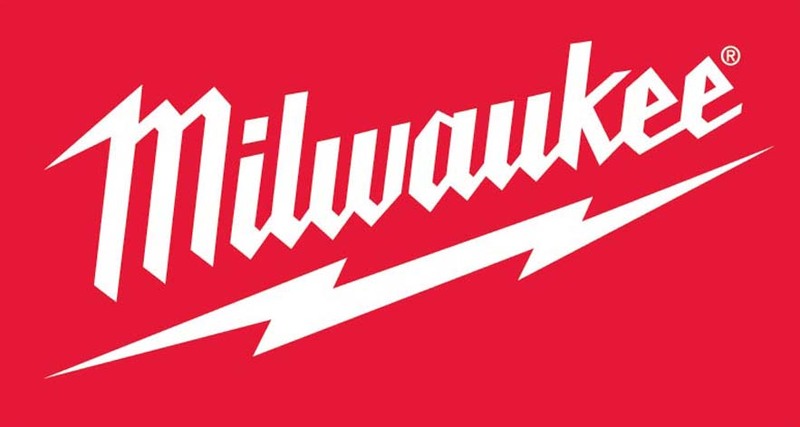 Milwaukee recommends that you turn the blower off when using dust extraction – we do agree that you get better suction without the blower on. 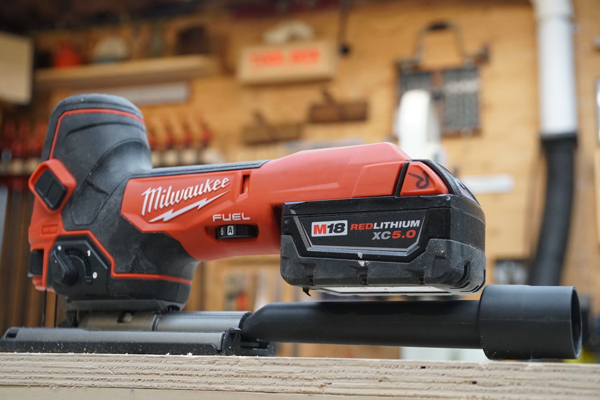 The Milwaukee M18 FUEL Jig Saw includes a dust cover and dust extraction tube which is connects to a vacuum hose. The saw does a great job at collecting dust, but it is no way near perfect. This jig saw, like many others, comes with a thin plastic blade cover that helps the dust collection system work better. 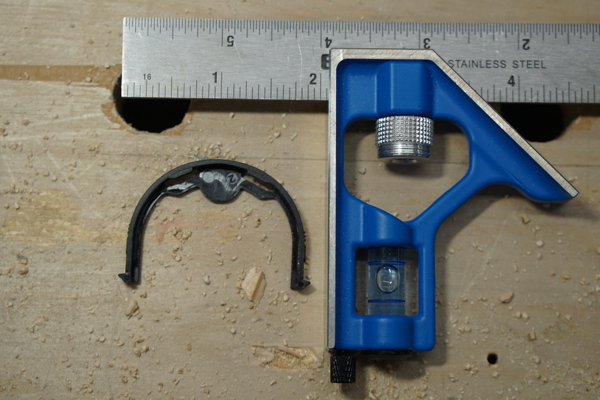 While it did work well, it’s a thin, cheap piece of plastic that is difficult to clip in place, and easily lost. 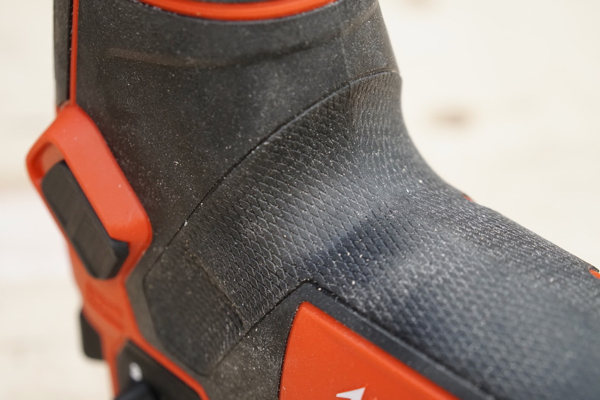 It also gets pretty dirty, impairing cut-line visibility, and needs frequent cleaning. Note – the dust collection tube cannot be used with battery packs larger than 5.0 ah. The larger batteries hit the tube. The M18 FUEL Jig Saw weighs 4.9 lbs. it is well balanced and has generous rubber over mold making it comfortable to use. All of the features are easy to use and adjust. The barrel grip is smooth to operate. There is very little vibration and bring low to the workpiece gives you better control in curve cutting and precision cuts. This is a great saw! My only real concern is the blade insert alignment issue we noticed. This could be a quality control issue or just a defect on our saw. We’re still testing this to see how often it occurs. 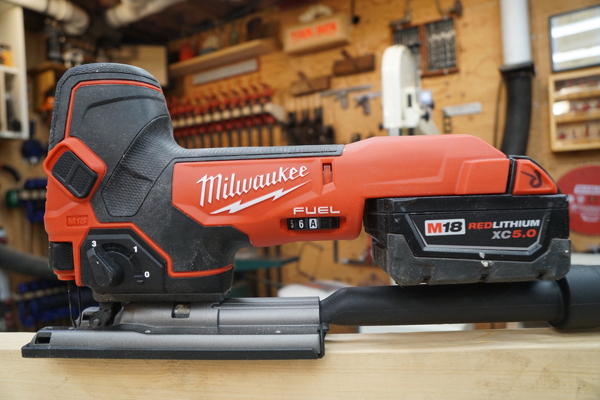 The Milwaukee M18 FUEL Barrel Grip Jig Saw is a nice saw, it has a ton of power, good dust collection and it plowed through all types of material easily – there is no wish for more power on this saw. It’s a nice jigsaw, and one that will find a location in our tool trailer.